There was once a very, very big mountain where there were lots of trees and bushes. It was also the home of a group of humans that lived in caves dug out of the mountain rock. In fact, there were two families there. One lived in a grey-coloured cave, the other in a greenish cave (which was due to the type of rock). Naturally, they were known as the Greys and the Greens. The Greys had a father, a mother and a fourteen-year-old son called Peter, while the Greens had a father, a mother, a four-year-old boy and a wise old grandfather. 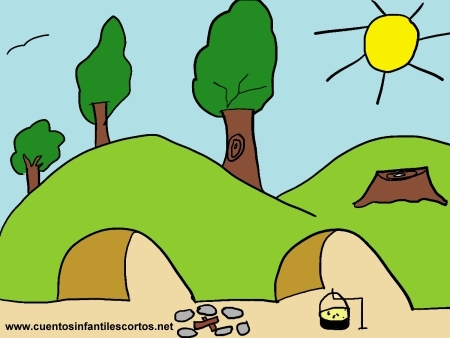 The two families sometimes ate together, when they would talk about the mountain trees and how to fell them to obtain the wood with which to make fire and heat. One time, Peter felt he was ready to join the conversation. The wise grandfather listened intently to the young man, because Peter believed that the trees were there to be felled, and that it didn’t matter if they were replanted or not because they took so long to grow back. Young Peter couldn’t understand what on earth the grandfather meant by this, and went home none the wiser. The wise grandfather from the Greens waited exactly one month inside the cave for Peter to come. He knew that all he needed was patience for his hair to grow back, and to teach the boy a lesson.